Title: 'Charte von Ost-Indien und den Angraentzenden Laendern'...'Geographi Mr. Herman Moll ... Durch M. Georg. Christian Bohnstedt Rector an der Dom-Schule zu Halberst'. This rare German map is based on Moll's larger version from his atlas 'The World Described'. 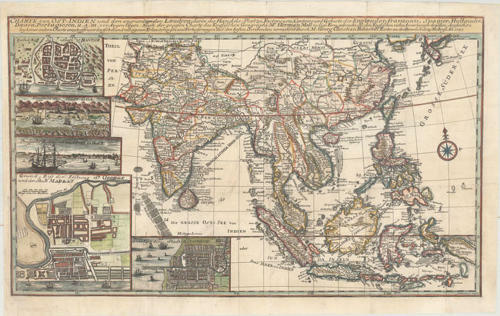 The geography extends from India to Japan, and south to include the East Indies. The map is filled with information on political divisions, towns, and roads. The mythical Chaamay See still appears in western China. Five large insets depict bird's-eye plans of Bantam, Madras (Chennai), and Batavia (Jakarta), as well as panoramic views of Goa and Surat. Engraved by Johann Benjamin Bruhl. Views and maps of Batavia, Madras, Bantain and views of Goa, Surat in the margin. In very good condition with some very minor printer's ink residue in the Bay of Bengal and a few minor chips in the left blank margin that have been professionally repaired and are very hard to spot.